Looks like the Mustang is the official muscle car of the UK. The right-hand drive Mustang has found massive success abroad, with those in the UK and Australia snapping up the muscle car like it’s going out of style or production. While Ford celebrates the success of its gamble rival Chevrolet looks on enviously. However, just because Chevy won’t swap the location of the steering wheel doesn’t mean that it can’t still try and compete abroad, right? Wrong. According to Evo, Chevrolet has all but thrown in the towel in the UK and will be sending just 18 Camaros overseas. Fifteen of those 18 cars will be coupes and the other three will be convertibles. Like Ford, Chevy is only offering the 2.0-liter turbo and big V8. There’s no room abroad for the naturally aspirated V6. The Camaro is obviously at a disadvantage due to the side of the car its steering wheel and pedals are on, but Chevy isn’t doing itself any favors with its pricing plan either. The 2.0-liter turbo models start at £31,755 ($41,398) and £35,755 ($46,613) for the coupe and convertible, respectively. The V8 model, the only one that can be had with a manual, will go for £38,245 ($49,860) should you elect to buy the hardtop and £41,020 ($53,477) if you want the option to drop the top. By comparison the Ford Mustang with an EcoBoost-four starts at £28,995 ($37,800) and the V8 model checks in at £32,995 ($43,015). Despite the difference in price and driver’s seat position Chevy will undoubtedly be able to sell 18 Camaros in the UK, even though Londoners are already bum over noggin for the Mustang. Why it decided to shoot itself in the foot by charging thousands more for its flagship muscle car remains a mystery, as does the thinking behind its laughably small allocation of units to the United Kingdom. 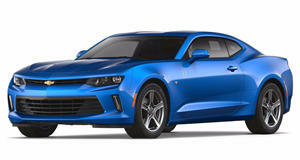 We've said the Camaro should be made in right-hand drive before. Maybe after seeing the success Ford has had the General will get those plans in motion. But first they've got to sell 18 cars.